Physical appearance : Sambar deed stands to a height of 135 -150 cm at the shoulder and can weigh up to 300 kg. Males have antlers measuring up to 1m. Its coat is dark brown in colour. It is characterized with large muzzle and broad ears. It has tick fur and orange spots on its body. Males are larger than the females. Its tail is 22- 35 cm long. Males have thick mane of hairs around the neck. Presence in India : Sambar deer is found in almost every corner of India, But it is mainly found in the central India. They can easily be spotted at Kanha, Corbett, Ranthambore, Bandhavgarh, Gir, Dudhwa, Manas, Kaziranga and Sariska. 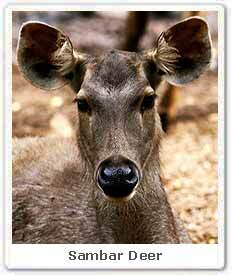 Habitat : Sambar Deer prefers marshy and wooded areas to live. 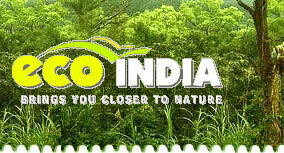 Diet : Sambar deer feeds on leaves, vegetation, herbs, fruit, bamboo buds and mushrooms. Reproduction :The breeding period is mainly during the months of November and December. The gestation period rests for almost 6 months after which single offspring is born. The young ones are weaned at about 7 months of age. Lifespan : The life expectancy of Sambar Deer exceeds up to 16 -20 years of age.